Darwin’s ideas of survival of the fittest resembled closely to the idea of eugenics ie superiority of Aryan Race espoused by Hitler. c) Hitler believed that a major reason why the Germans lost World War 1 was because of non participation of Jews Darwin’s theory have been fitted to explain several various social movements such as racial egalitarianism, feminism, Marxism etc. Nazism and Fascism were opportunistic ideologies and Hitler was just searching for a scapegoat to rally the Germans around him. Externalizing the source of the problem often have benefits for political leaders. To conclude Darwinism does not inevitably lead to Hitler. At the very best it might have provided him some rational basis for his Anti Semitism. The roots of Hitler’s rise and 2nd World War can indeed be found in the Treaty of Versailles. a) Burdensome reparations imposed after World War I, coupled with a general inflationary period in Europe in the 1920s—another direct result of a materially catastrophic war—caused spiraling hyperinflation of the German Reichsmark by 1923. This hyperinflationary period combined with the effects of the Great Depression (beginning in 1929) to seriously undermine the stability of the German economy, wiping out the personal savings of the middle class and spurring massive unemployment. b) Such economic chaos did much to increase social unrest, destabilizing the fragile Weimar Republic. c) Efforts of the western European powers to marginalize Germany undermined and isolated its democratic leaders and underscored the need to restore German prestige through remilitarization and expansion. 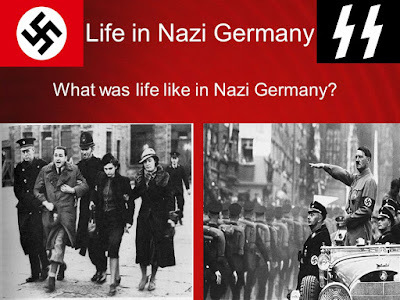 d) The social and economic upheaval that followed World War I powerfully destabilized Germany's fledgling democracy and gave rise to many radical right wing parties in Weimar Germany. Particularly detrimental in connection with the harsh provisions of Versailles was the rampant conviction among many in the general population that Germany had been "stabbed in the back" by the "November criminals"—those who had helped to form the new Weimar government and broker the peace which Germans had so desperately wanted, but which had ended so disastrously in the Versailles Treaty.